This is a circular route so you can choose to start in any location. 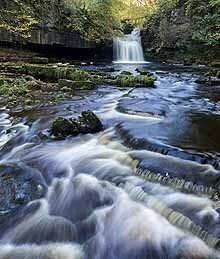 Our itinerary is described starting from Aysgarth in a clockwise direction. This is the traditional way to walk it and is how the guidebook describes the route. We have two walks covering the full route. The longer itinerary of 5 walking days splits the Aysgarth to Hawes leg at Askrigg to make two shorter days. This allows you to ease yourself into the walk gradually before the next three longer days, and also gives you time to explore the market town of Hawes.